This section of a 1917 chart below shows the lights on the piers and breakwaters at the entrance to Cleveland Harbor. Over the next couple of days, we will take a look at the lights which guided mariners into this important harbor over the years. In 1830, a contract was awarded to Cleveland businessman Levi Woodbury to build the harbor's first lighthouse. Known as the Cleveland light, it was erected on high ground at the foot of Water Street on the east bank of the Cuyahoga River. Of relatively rough construction, it was typical of the type of lighthouse structure built on the lakes at that time, as seen in this 1858 photograph. On November 25th 1831, a year after the establishment of the main light on shore, a pierhead beacon known simply as "The Cleveland Beacon" was erected on the outer end of the short east pier at the entrance to the Cuyahoga river. The structure exhibited 4 lamps equipped with 14" reflectors and the lantern was reported to be so so narrow that it made maintenance of the lamps very difficult for the keeper. Shown below is the known photograph of this original Cleveland Beacon. With the elongation of the east pier at the entrance to the Cuyahoga river and the deteriorating condition of the 20 year old beacon, the decision was made to replace the structure with one of more modern design. To this end the unique 40-foot tall iron beacon shown in the accompanying photograph was erected on the outer end of the east pier in 1851. Originally outfitted with the Argand lamps and reflectors from the old beacon, they were replaced with a more effective fixed Fourth Order Fresnel lens in 1854. As the 1870's dawned, the forty year old Cleveland Main light was in horrendous condition. The Army Corps of Engineers was planning a complete rebuilding and extension of the two piers guarding the Cuyahoga and with the completion of this project the Lighthouse Board would be required to light the ends of both piers. As such, the Board was facing the need to hire additional keepers to man three discrete lights and the inevitable irritation of providing living quarters for the keepers and their families. To accommodate this change, the decision was made not to request any funds to repair the old main lighthouse, but instead to completely raze the old station, incorporating a taller tower and a large dwelling with separate apartments for up to four men and their families as shown in these original plans for the station. Over 1872, a large crew of workmen toiled to build the structure shown in the accompanying photograph. On completion of construction in January 1873, the new Cleveland Main light was arguably one of the most impressive and elegant light stations built by the Lighthouse Board in the fifty-plus years it would be responsible for the nation’s aids to navigation. With its glistening new Third-and-a-half Order Fresnel lens standing 84 feet above the dressed limestone foundation, the city gas illuminated light stood 154 feet above the water, and was visible for a distance of 10 ½ miles in clear weather conditions. With construction of the new Cleveland Main light complete, Tenth Lighthouse District Engineer Lieutenant Colonel C E Blunt turned his attention to the deteriorating twenty year old iron beacon on the east pier. With the future elongation of the pier on which it was to be located and the need to relocate the structure in the near future inevitable, Blunt submitted this plan for a free-standing timber frame beacon which could be easily relocated as the need arose to his superiors with the Lighthouse Board in Washington for their approval. The Lighthouse Board approved District Engineer Blunt's plan for the new Cleveland East Pier light, and the structure shown here was erected at the outer end of the east pier over 1875, with its light first exhibited to guide mariners into the Cuyahoga River on the night of September 1. With the Army Corps of Engineers busy extending the west pier at the entry into the Cuyahoga river, the east pier was not the only area within Cleveland Harbor to receive Engineer Blunts' attention in 1874. Simultaneous to his submission of the plan for the new East Pier light, Blunt also included this plan for a new light to be established on the outer end of the West pier. 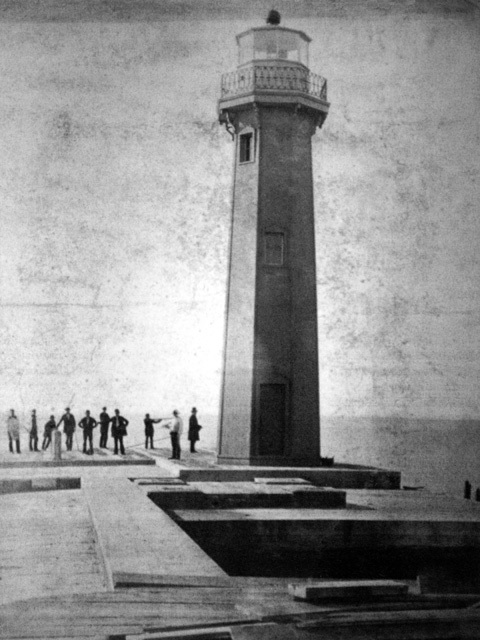 Again, the Lighthouse Board approved Blunts' plans, and the structure shown here was erected at the outer end of Cleveland's west pier on the opening of the 1875 season of navigation. The frame building attached to the beacon housed a large bell of three feet in diameter which was operated during thick weather by a clockwork bell striking mechanism. With the dawn of the 1880’s the Cleveland harbor was becoming an increasingly hectic place. With the piers protruding out into the lake, entry between them was difficult during foul weather, and with huge numbers of vessels entering and departing, many masters were forced to wait for long periods out in the open lake until dockage was available within the harbor. To help assuage the problem, the Army Corps of Engineers embarked on the major project of constructing a pair of breakwaters running parallel to the shore in order to create a large stilling basin and harbor of refuge. By the summer of 1884, work on construction of the first phase of the breakwaters at Cleveland was nearing completion, and Tenth Lighthouse District Engineer C E L B Davis turned his attention to lighting the main entry between the two breakwaters. Since they were already on site building the breakwaters under contract to the Army Corps of Engineers, it is hardly surprising that contractors J A & LP Smith were low bidders on Davis’ advertisement for the construction of a forty foot square timber crib standing 26 feet high to be towed out to the easterly end of the west breakwater and sunk in place with stone to serve as a foundation for the new light. In accordance with the terms of the contract, the Smiths completed the crib in the summer of 1884, but it was allowed to settle a full year before work was scheduled to begin on the lighthouse itself. Tenth Lighthouse District Engineer C E L B Davis arrived in Cleveland on the tender WARRINGTON on July 28, 1885 and inspected the crib foundation placed on east end of the west breakwater the prior year. Finding it to be well seated and plumb, work began in erection of the lighthouse itself, which took the form of an octagonal cast iron structure standing 27 feet in height and capped with an octagonal lantern housing a fixed fourth order Fresnel lens at a focal plane of 36 feet. A fog bell was suspended from an iron bracket attached to the outer wall of the structure and operated by a clockwork striking mechanism within the tower. Lighted for the first time on the night of October 20, there are unfortunately, no photographs of the Cleveland West Breakwater East End lighthouse in its original condition are known to exist, but it would have appeared virtually identical to this structure which once stood at Oswego on Lake Ontario. Between fog and ever thickening smoke from the stacks of industries around the harbor, the bell on the West Breakwater East End was working double time and was practically insufficient for its purpose. At the request of the Lighthouse Board, Congress appropriated the funds required to upgrade the bell to a single steam-powered fog signal on March 2, 1889. A contract for a 30-horsepower vertical boiler, 10-inch whistle and the necessary ancillary equipment along with the construction of a fog signal building, boat house and work room out on the breakwater was awarded in July 1890. Construction on the improved West Breakwater East End light station was completed on October 30 of that year, with the modified structures appearing as shown in the accompanying photograph. While the fog signal on the Cleveland West Breakwater East End light station proved to be a real boon to mariners during thick weather, its reception by the citizenry of Cleveland was less than than ecstatic, with numerous letters of complaint concerning its moaning at all hours of the day and night being received by the Tenth Lighthouse District office and the Cleveland newspapers. Not immune to the sensitivity of the public, the fog-signal building was modified in 1896 to include a circular concave sound reflector, with the whistle in the center, to lessen the volume of the sound in the direction of the shore, as shown in the accompanying photograph taken immediately after the modification was completed. While we have thus far focused on the light on the east end of the Cleveland west breakwater, there was a light on the west end of the east breakwater since the initial phase of breakwater construction was completed in 1885. However, in comparison to its mate on the other side of the main gap in the breakwater, it was fairly insignificant, consisting of a lens lantern hoisted to the top of a 20 foot pole. This diminutive structure was changed to something a little more appropriate for one of the busiest harbors on the lakes in 1892 when this 30-foot tall skeletal structure was erected to improve visibility of the west end of the east breakwater. Its timber construction growing long in the tooth, the Army Corps of Engineers set about resurfacing both the east and west piers at the river mouth with concrete in the late 90’s. With this reconstruction, the Lighthouse Board faced the need to either relocate the 25 year old west pierhead light or build a new structure to replace it. With a focal plane of only 40 feet, the old structures’ small sixth order light was easily lost to mariners among the increasing number of lights within and around the harbor. So Tenth District lighthouse engineer Major T W Symons proposed the erection of a unique 60-foot tall circular timber pierhead light sheathed with metal shingles to replace the aging structure. Estimating the cost of the structure to be no more than $5,000, Congress responded with the necessary appropriation, and the new West Pier Light shown here was erected over the summer of 1900 and its light exhibited for the first time on the night of November 1 of that year. A nice color postcard view of the renovated Cleveland West Breakwater East End lighthouse from 1909 light showing the elevated tower. A circa 1909 color postcard looking out along the West Pier at the entrance Cuyahoga River. This is a particularly interesting image because in addition to showing the Lifesaving station in the foreground, it places most of the Cleveland harbor lights in perspective to each other. At the outer end of the pier beyond the Lifesaving station the cream and brown painted West Pier light is clearly visible. In the distance, just to the left of this tower, you can readily make out the West Breakwater East End light station, while to the right of the West Pier tower you can see the skeleton tower of the East Breakwater West End light. The steamer heading into the opening between the breakwaters makes it plain why all of these lights were so vital to maritime safety. In 1907 the Army Corps of Engineers began construction of a pair of angled pierheads protruding from the east and west breakwaters designed to provide additional stilling of the waters at the main harbor entrance between the breakwaters. Since federal law required that the Lighthouse Board light all piers, Tenth District Lighthouse Engineer Colonel Henry M Adams set about preparing plans and specifications for lights for both pierheads on completion. Since these lights would serve as the primary leading lights into the harbor, Adams plans called for substantial cast iron structures on both pierheads. This enlargement of a 1917 chart of Cleveland Harbor shows the location of these two angled pierheads and the lights that would eventually be established upon them. With construction of the new pierheads nearing completion in 1909, temporary pole lights were established on the east and west pierheads on March 25 of that year. Immediately thereafter, a contract for furnishing the metalwork and equipment and erecting the structures themselves was issued to masonry contractors Henahan and King after their bid of $40,000 for the work was found to be the lowest received. The tower on the west pierhead was erected before its adjoining fog signal structure, as shown in this photograph taken during construction. The iron tower on the east pierhead consisted of the smaller structure shown here. Since the larger structure on the West Pierhead had keepers permanently assigned to tend it, it exhibited a fourth order lens at a focal plane of 63 feet with a characteristic alternating red and white flash every five seconds. However, since this smaller light on the East Pierhead was automated through the incorporation of an acetylene system with sun valve, it exhibited a group of 3 fast flashes every six seconds from a lower focal plane of 39 feet. Both West and East Pierhead lights were placed into commission for the first time on the night of March 25, 1911. With the commissioning of the new fog signal on the Cleveland West Pierhead in 1916, the crew from the West Breakwater East End light was reassigned to the new station and the light in the old station automated through the installation of an acetylene system. No longer needed, the old fog signal building and boathouse associated with the station were removed from the breakwater, leaving only the elevated cast iron tower marking the outer end of the breakwater as seen in this photograph. By the late 1930’s, the old timber frame lights on both east and west piers at the Cuyahoga River and the elevated iron tower on the West Breakwater East End had been replaced with standard skeletal iron towers with integrated acetylene sheds. This photograph of the light erected on the end of the East Pier being typical of the type. The skeletal iron acetylene tower on the outer end of the Cleveland West Pier light as it appeared in 1925. Note the trees that had grown up around the old Lifesaving station further down the pier in an area which was known to local residents as "Whiskey Island." Responsibility for design of the new Cleveland Coast Guard station was awarded to renowned Cleveland architect J. Milton Dyer, who had made his mark through design of a number of prominent Cleveland buildings including the City Hall in 1916. Built on the West Pier in 1940, Dyer’s design took the form of a modernistic group of buildings with a tip of the hat to the Coast Guard’s new lighthouse responsibility represented by the tall watch tower at the center of the complex, as seen here in this aerial photograph taken in 1951. The Coast Guard operated the station on “Whiskey Island” until 1976, when they built new a new facility near North Coast Harbor. The property was later sold to a development company that operated part of the buildings as a night club. While we have read that the City purchased the property in 2003 and had plans for improvements, they were not forthcoming when these photos of the sadly deteriorating structure were taken in 2009. The two pierhead lights still shine from the original 1911 lanterns, though the structures are deteriorating badly. The light on the East Pierhead is now officially listed as the “Cleveland Harbor Main Entrance Light 1” and the breakwater around the light has been refaced with sheet piling, somewhat obscuring a good view of the diminutive structure as shown here in this photograph taken during our 2011 Lake Erie excursion. The light is now provided by a small solar-powered LED emitting an isophase characteristic green flash of six seconds duration. The West Pierhead light is now officially listed as the Cleveland Harbor Main Entrance Light. As can be seen in this photograph taken during our 2011 Lake Erie Excursion, while the tower appears to be in relatively good condition, the concrete of the breakwater was deteriorating and the fog signal building was in sadly deteriorating condition. As is the case with the light on the east pierhead, the light has been replaced by a three-tiered solar-powered LED array, which exhibits a characteristic red flash every six seconds. In August 2012, contractors were seen removing sections of deteriorated concrete from the pier beneath the Cleveland Harbor Main Entrance light. While we assume that they were preparing to reface the sides of the pier with sheet piling and fill-in with concrete as had previously been done, as of this point we have not had the opportunity to return to Cleveland to see what the end result might have been.